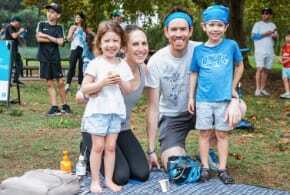 On the last sitting day of Australia’s Parliament and Senate the Jewish festival of Chanukah was celebrated at the now yearly pre “ Chanukah on the Hill ” event. 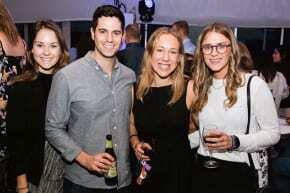 Jewish politicians from the House of Representatives and the Senate as well as other politicians from all sides of politics joined the new Israeli ambassador to Australia came to enjoy the preview of next week’s popular Jewish festival. Traditional Chanukah food including latkes and donuts and other delicacies were prepared by Rebbetzin Chasia Feldman of Chabad ACT and the Canberra Kosher team. Michael Danby MP, who MC’d the event, spoke about the importance of Chanukah and the significance of it being commemorated in the nation’s Parliament and gave a vote of thanks to the team at Chabad ACT who helped his office put the event together. An invocation prayer authored by Rabbi Pinchus Feldman was then read by Harry Chaim Oppermann. Minister for the Environment and Energy Josh Frydenberg MP and MP Julian Leeser MP gave greetings on behalf of the Government . 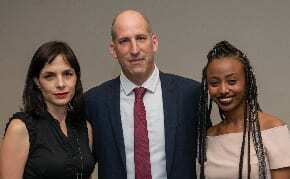 The new Israeli ambassador to Australia Mark Sofer gave greetings stressing the significance of U.S President Trump’s announcement of earlier in the day, recognising Jerusalem as the eternal capital of the Jewish people. Rabbi Shmueli Feldman , Chairman of Chabad ACT, delivered a Dvar Torah speaking of the messages to be learned from the Menorah; the eight candles tell us to get of the square and increase our acts of goodness and kindness – an additional candle each day, and lighting up the darkness of the world – through bringing light. Theo Menachemson – treasurer of Chabad ACT lit the Shamash with Rabbi Shmueli Feldman reciting an improvised blessing as Chanukah does not start until next week. 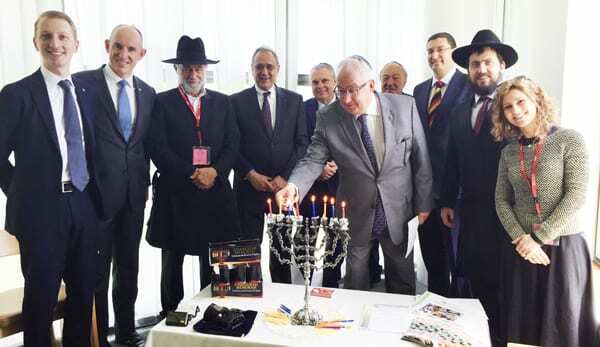 The eight candles were then kindled by the Jewish politicians, other Members of Parliament and the Israeli Ambassador to Australia by Josh Frydenberg, Julian Leeser, Dr Mike Freelander, Senator Stirling Griff , Ambassador Mark Sofer , Reb Michael Kiel , Senator James Paterson , Stewart Robert MP and Michael Danby MP. Rebbetzin Chasia Feldman, co-director of Chabad ACT, concluded the ceremony blessing all those in attendance and spoke of the significance of the date, the 19th of Kislev, which is celebrated in Chabad as the Rosh Hashana for Chassidus and the festival of redemption. 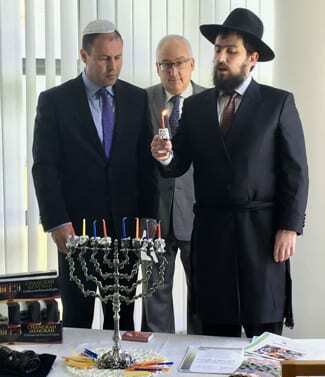 In attached picture two from right: Rabbi Shmueli Feldman making the blessing on the Menorah lighting, Michael Danby MP and Josh Frydenberg.